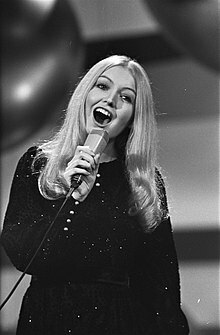 Mary Hopkin (born 3 Mey 1950) is a Welsh sangster. Hopkin wis born in Pontardawe. She began her career as a fowk sangster. He released her first record on the label an in Welsh Cambrian, Swansea company. Efter winnin the gystadlaeath TV Opportunity Knocks wis ane o the first tae record tae sign tae Apple Records. She wis marriet tae Tony Visconti 1971-1981. Thair childer include Jessica Lee Morgan an Morgan Visconti. ↑ Roberts, David (2006). British Hit Singles & Albums (19th ed.). London: Guinness World Records Limited. p. 259. ISBN 1-904994-10-5. ↑ "Joel Whitburn's Top Pop Singles 1955-2002"
↑ "Joel Whitburn's Top Adult Contemporary 1961-2001"
Wikimedia Commons haes media relatit tae Mary Hopkin. wi "Jack in the Box"